When Vin Diesel announced that the astronomically lucrative Fast and Furious franchise would be kissing the blockbuster life goodbye with a "goodbye trilogy" of three final films, the world was briefly perplexed but eventually sobered. Only three more? That&apos;s the best you could do, Vin? Thankfully, just weeks after announcing Straight Outta Compton director F. Gary Gray as the helmer for the forthcoming Furious 8, news broke that this "goodbye trilogy" would actually be accompanied by a slew of prequels and spin-offs. "We’ve written out story lines for various characters," Diesel told Variety. "We’ve been playing with it for a long time. It’s a very rich property and we’re committed to treating it with a lot of class." 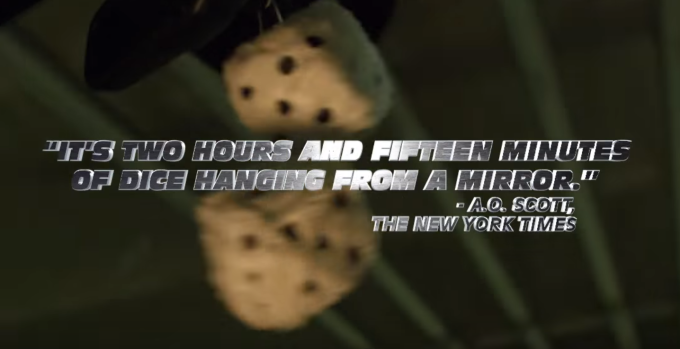 As many continue to fruitlessly speculate about how exactly the franchise will expand into a Marvel-envying cinematic universe, Jimmy Kimmel bypassed the usual pitch process and quickly delivered the first trailer for his own proposed spin-off, the aptly titled The Fast and the Furious: The Dice Chronicles.